In case you don’t know that brown, black, and gray = men, it says so right on the box! Apparently these are on sale in the U.K. I haven’t seen them in the U.S.
Also in gendered products: tv dinners, uniforms, candy bars, ear plugs ‘n stuff, deodorant, Pepsi, and mosquito repellent. It's funny because I grew up with these and now that you have put it in front of me, the use of "for men" looks odd. anyone who thinks that tissues for men are actually different than tissues for women.. are IDIOTS and deserve to have their money shelled out for corporations. I like how the woman in the corner of the 1964 ad might use them if she had a "man-size cold". Heh. It looks like the older ad emphasizes the size/strength of the tissue, which is dumb, but at least makes some sort of sense. The newer box is purely about gendered color. I like the idea of tissue boxes that aren't pink and floral, but I hate that they have to be "male." 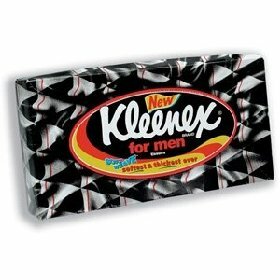 It's pretty telling that the "for men" tissues are also marketed for women's use. Can you imagine a product very clearly gendered for women being marketed as also useful for men? All that comes to mind for me are those Fair & Lovely (& Blisteringly Racist) ads where the men are sneaking their girlfriends' Fair & Lovely cream—but of course they solved that by coming out with a "for men" version. ha - Fair and Lovely! Although I noticed some years ago that the Japanese candy 'Pocky' also do a Pocky Men's. "Kleenex for men" just reads like the intro to a very dirty joke. 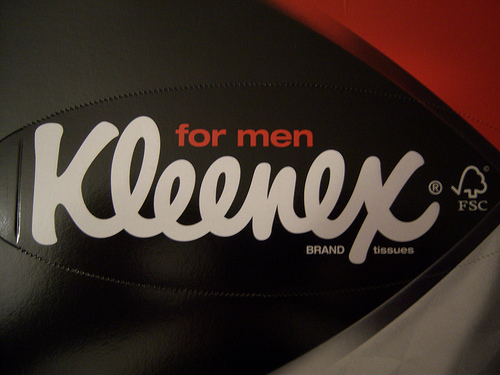 The commentary misses the main difference between normal Kleenex and Men's Kleenex: size. They're enormous, much larger than women's tissues. Unfortunately, the pictures don't illustrate the size difference. Sorry, but I applaud Kleenex for making tissue boxed in colors other than lavender, pink and baby blue. I guess the fact that they call them "for men" is the problem? As if women wouldn't want a black box of kleenex? okay, usually gendered products get me all riled up. 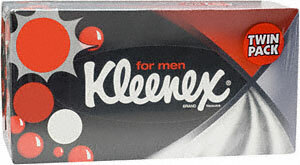 but kleenex for men made me actually laugh out loud. how absolutely, positively ridiculous. it sounds like something Saturday Night Live would do as one of their parody commercials. anyhoo- kleenex boxes in the states, at least in PA where i live, come in all kinds of colors and designs, including some that are stereotypically related to men, like fishing and football themed, but they aren't gendered. Yeah, Kleenex and Sorbent and whatever other brands we have in Australia have boxes or regular tissues that come in all kinds of colours and patterns. Floral, animals, abstract, embossed, etc. http://www.sorbent.com.au/index.php?page=facial-tissues for examples. That brand has "thick n large" tissues instead of "man sized". 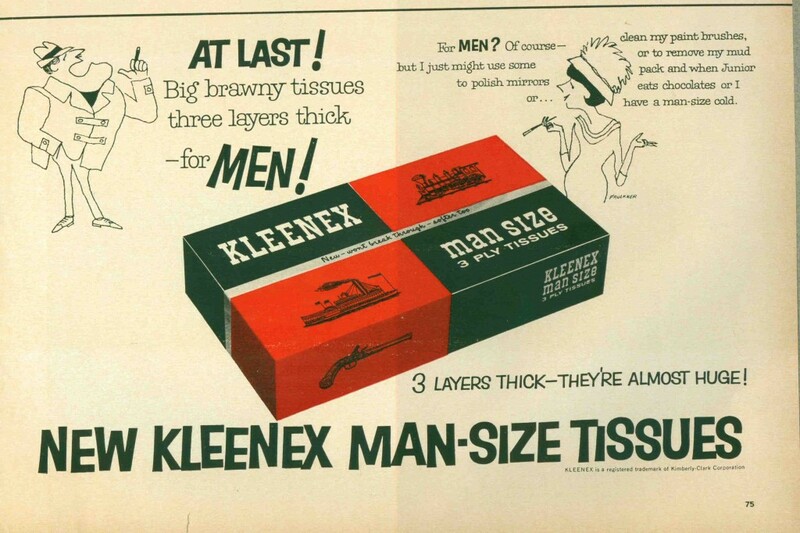 Kleenex does "man" tissues but the only designated Man Box designs are an old-fashioned map, and some sports gear. I'm wondering if those specific Kleenex man-designs will hit shops here by next season. This is interesting and terribly stupid. I was at the drugstore the other day and there was some lotion marketed to men (I think the brand was Vaseline). The bottle was colored oh so manly black and the text explained that it "tackles" dry skin. Tackles? How ridiculous and transparent. Jeremy Osborne: [holding some Mansize tissues] Look, people will think we spend the whole time wanking. Mark Corrigan: Don't be ridiculous, they're for wiping up mess. Jeremy Osborne: Yeah, man mess. That's why they're mansize. Mark Corrigan: They're for men - men's noses, big manly snot. @Beccy: New episode next friday. yeah! because only men can handle dark chocolate? Anyone else notice the PedEgg recently introducing the "For Men" option? "It’s not just the ladies who’ll be searching for a super-soft finish on their soles. Often neglected male feet deserve just as much attention as women. Especially if you play a great deal of sport, as it can often lead to a thick build-up of callused skin. A DIY fix with PedEgg for Men means you can avoid hefty salon prices and enjoy the pedicure experience from home - without feeling out of place in a women-only zone. The ultimate pampering product for lazy boys, now you can file and buff your way to smoothness thanks to 200 precision microfiles. And because PedEgg for Men is 30% bigger than original PedEgg, it’s specially designed to fit more comfortably in the palm." The first box vaguely reminds me of a generic design for a soda case. The last one is bizarre as hell. Kleenex: Now comes in Train, Boat, and GUN! Do we really need that kind of "masculinity" to not feel emasculated for blowing our noses? I think that Kleenex for men is probably really Kleenex for masturbation, with a little subtlety. Interesting to note that in the UK Kleenex offers those big man tissues, little floral-boxed woman tissues, and virus killing tissues in a neutral green box. I guess that means we all get ill, but in general man mess is bigger than woman mess. i saw these when i was in england long ago and brought some home because i was all, 'what the? ', and just displayed them in my room. 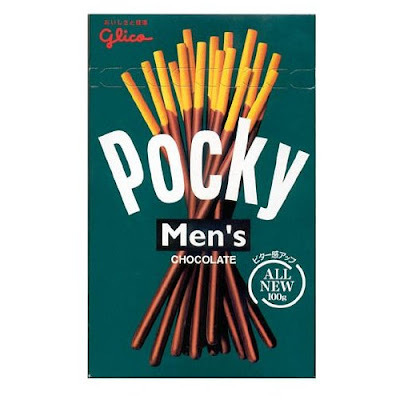 (men's pocky too actually). but something you might not realize is that in addition to being much larger and -stiffer- than regular kleenex, the edges of the kleenex for men have a design on them, like a sit down resaturant paper napkin. of course we thought of the masturbation thing, but i got the impression that you were supposed to carry the men's kleenex around like a hanky, in the chest pocket of your suit jacket. and i'm standing by that as the impetus for creating this product. regular kleenex are very dainty, and it wouldn't look passable in a suit pocket, but they can kind of pass as a ladie's dainty hanky, no? that all said, i used to buy men's razors because they came in black. i couldn't bear to have pink and pale blue disposable razor's around. (i don't buy razors anymore because i stopped shaving my legs in the 90's). i noticed that the gillete products, when you compare the boy version and the girl version, use different language on the packages, in addition to the color difference). the mens has more active verbs and "lubrication" strips, while the women's have more passive verbs and 'moisturizing' strips. and of course the products are exactly the same. I'm torn between feeling repelled by the sexism and feeling that I would never use "men's Kleenex" because they're probably like sandpaper. What's sad about this is how effective it is. I first saw it and thought "Awesome!" That color scheme did look manly. It did resound with my sense of style. How on earth does that happen? How does black and red and white come to mean male? Do women not have a right to wear those colors, or use these tissues? By the way, man tissues are infinitely more masculine and manly than pansy tissues. Leonidas uses them to clean up his beer spills, because he's a MAN. and men drink BEER. Kleenex was first marketed in the 1920s for removing make-up. Then the company learned women were using it to blow their noses. So, I reckon there were male oriented ads at this time as well.